A “luggage-free” package (2 to 6 days) comprising: half-board accommodation (dinner and breakfast) in our partner hotels and/or B&Bs, picnics, luggage transported between the accommodation facilities. 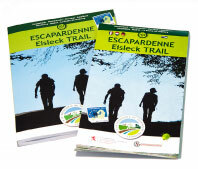 Discover the unspoilt nature and the green landscapes of the Luxembourg Ardennes while hiking on the Lee Trail (53 km). The trail is divided into three stages and the package includes the transportation of your luggage to make sure you can enjoy the trail unburdened. Peaceful nights of rest will be guaranteed at the selected 3 and 4 star hotels.